DOT will present a redesign for Brooklyn’s Fourth Avenue that includes protected bike lanes from 65th Street to Dean Street, Transportation Commissioner Polly Trottenberg said today. The announcement signals an important shift from earlier plans that called for casting the current design of Fourth Avenue in concrete without adding bike infrastructure. The new design concept is very encouraging because it shows DOT is willing to adjust major street reconstruction projects to maximize safety and extend the bike network. The question now is whether the agency will follow through and implement the more ambitious design. In 2012 and 2013, DOT installed wider medians and other pedestrian safety improvements along Fourth Avenue, cutting pedestrian injuries by 61 percent in Park Slope and 30 percent in Sunset Park. The agency planned to build out that design in permanent materials this year as part of Mayor de Blasio’s “Vision Zero Great Streets” initiative, which would have squandered a once-in-a-generation opportunity to add safe bike infrastructure on the best available route linking Bay Ridge, Sunset Park, and Park Slope. The new proposal, which will get public hearings at an upcoming workshop and presentations to community boards 2, 6, and 7, replaces the previous plan’s 13-foot parking lanes with five-foot curbside bike lanes protected by a 2.5-foot buffer and eight-foot parking lane with concrete islands at pedestrian crossings. Not only would that design make many more New Yorkers comfortable biking on Fourth Avenue, crossing distances for pedestrians will also be shorter thanks to the concrete islands. The overall safety improvement should be greater than the initial design. Council Member Carlos Menchaca has championed the idea of adjusting the Fourth Avenue design in meetings with DOT about the project since last March. “I thank the DOT and Sunset Park’s Community Board 7 for accomplishing something government seldom does; pausing a large construction project, listening to the people, and considering additional options like pedestrian safety islands and protected bike lanes,” Menchaca said today. Today 4th Avenue in Brooklyn. Tomorrow Broadway and West End Ave in Manhattan! Please don’t stop short at Dean. Connect this to Ashland/Hanson. The chance to redesign the upper 2 blocks of this and Times Plaza may only come every 50 years. It’s critical to not have a huge hole in the cycling grid for that timeframe. I just hope they don’t start putting this in and then rip it out again during the marathon. What about the section of 4th in New Utrecht? If this is approved the only “Great Street” without a proposed bike facility will be Atlantic Ave right? Wow. Many thanks to Carlos Menchaca, CB7 and the advocates in Sunset Park for pushing this and to Polly Trottenberg and DOT for picking up the ball and running with it. This is a once in a generation opportunity to remake a key Brooklyn thoroughfare to the benefit of all users, that was almost lost. That said, I do hope a bike connection from Dean Street through Times Plaza to Ashland Place will be included in the plan or as part of further upgrades to Times Plaza. Because three (!) community boards are involved here, I hope DOT and the local City Council members will remember that boards are advisory only. Community outreach and notification are importation but DOT should have a goal of just getting this done as quickly as possible. These are precisely the streets that need physically separated bicycle infrastructure the most (Qns Blvd, Grand Con, 2nd Ave, etc). Many New Yorkers are explicitly afraid to travel down these corridors, typically the most direct routes to and from places where people want to be. It’s a major hindrance towards increasing the number of bicyclists. For minor streets, the city should focus on slowing and better restricting the traffic flow (narrower lanes, speed humps, etc). Glad to hear of this revisiting at the behest of Sunset Park residents and Councilman Menchaca. I’ve always felt that 4th Ave PBLs had to happen sometime; the painted lanes on 5th Ave can’t be considered the be-all-end-all for cycling infrastructure along this corridor if the City of New York aims to make its streets safer for not only current cyclists, but also for those who would start cycling if it became less daunting to. One thing to look out for going forward is intersection design, because I doubt they’ll use split signal phases for every intersection. Not that they’re always the best choice of course. This is fantastic!! While they’re at it, this would be a great place to introduce protected intersections! Should be a pretty simple addition of a corner refuge island. Trottenberg’s DOT seems to be creating a legacy of taking the designs created piloted under JSK and then scaling them up and using them to fill in the gaps in the network. This is great! That said, they still are lacking many tools needed for a high quality bike network, namely protected intersections, bike boulevards (aka low-speed + low volume neighborhood streets that prioritize direct biking and walking), and something (anything!) linking the east and west sides of Manhattan. I’d even like to see them doing simple things like two-stage turn boxes. There are lots of spots where making a left turn by merging with traffic is suicide. Paint on the ground in these cases might make sense and are simple ways to start experimenting. I have heard that a Times Plaza unveiling is just weeks away. This is a really crucial route— whereas many trips in Brooklyn have a quiet side-street alternative, cyclists are channeled to either 3rd, 4th, or 5th Avenues by Green-Wood Cemetery, none of which are terribly good options right now. And there’s huge cyclist traffic down this corridor, as many bicycle deliverymen live in Sunset Park. 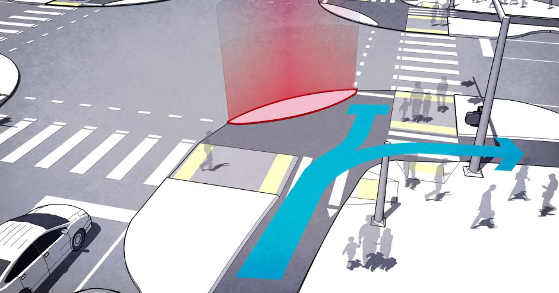 In this design, what’s the plan to keep pedestrians from blindly walking into, and just standing, in the bike lane? Or is it that bikes would have to yield to pedestrians at every intersection whether they have the light or not? I usually dislike protected bike lanes (ex. 1st and 2nd Ave in Manhattan, that monstrosity they just put on Christie st, etc… ) But this street seriously needs it. 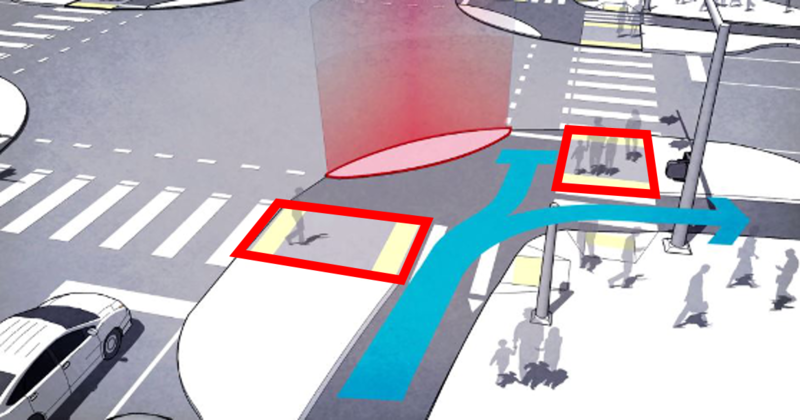 That’s the genius of protected intersections, they give pedestrians a dedicated space to wait after they’ve crossed the bike lane but before crossing the car lanes (see red outlined areas). I agree with your points that many New Yorkers are afraid to bike in these streets and that these physical barriers are needed in these areas. I am convinced that these new physical barriers separating the bike lanes would increase the amount of people who travel by bicycle. Due to the current infrastructure, people are less incentivized to bike since it is unsafe to travel on the current roads. This likely contributes to the traffic on these popular streets too. New bicycle infrastructure that includes physical barriers, painted areas on the streets, and intersection improvements can increase bicyclists and hopefully decrease traffic in these areas. I would also be interested to see how bike-sharing programs could be integrated with the new bicycle infrastructure. They forgot to program the Angry Robot so it could provide replies. My #1 complaint about protected bike lanes is pedestrians that don’t treat the bike lane as a lane of traffic. On first ave it’s extremely common for people to walk through the bike lane without looking. When this happens while riding at a reasonable speed (15-20mph) and catches you by surprise, maybe they just walked out from between cars, you’re left with a few no good options, into the cars, into the curb, or into the pedestrian. I usually do everything i can to not hit the pedestrian but the last time that happened and i got hurt, the pedestrian just ran off like it wasn’t their fault I had to hit the brakes so hard I flipped over the handlebars. On Christie the bike lane is already used as a gathering area at the light at the intersection of Hester and in other places it’s just gets used as a sidewalk. It’s also getting filled with trash already but maybe street cleaners will be better able to get that as spring comes and the snow is gone. Another issue I have with them has to do with turning drivers. If you’re riding in the lane of traffic they have to go around you and turn or wait behind you and turn, either way they see you. They can’t always see you if you’re behind a row of parked cars and even with the turn lanes on 1st and 2nd ave they don’t always check to see if there’s a bike there. Then there’s the complaint about people parking in them, from cabs and ubers to delivery trucks. When this happens on a two way protected bike lane (ex. Kent ave), depending on your direction of travel, you’re left with the option of riding head on into traffic or getting off and walking your bike on the sidewalk. So really, protected bike lanes just feel more dangerous to me. I prefer having a bike lane on the other side of the cars where pedestrians are less like to blindly walk and I’m more visible to cars. I certainly agree with you about pedestrians (will get better as time goes on and hopefully sidewalks can be widened someday, too), people parking in bike lanes (needs better enforcement or physical barriers that make it impossible), turning drivers (need dedicated lights), but riding in the door zone between parked cars/parking cars/double-parked cars/cars pulling out of parking spots and 40 MPH traffic/cabs pulling over illegally to drop off or pick up fares…this is exponentially more dangerous, and indeed, we know that avenues with protected bike lanes, despite their flaws, are much safer than avenues with painted door-zone lanes or nothing at all. So, again, I get where you’re coming from, but I think you should look at the bigger picture.